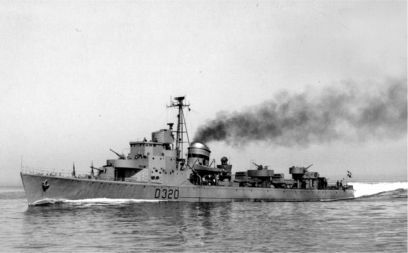 HUITFELDT as "Kystjager" (destroyer), the pennant # is here D320. *) Ships were intended to carry 120 mm Guns. **) Form the torpedo boats of the DRAGEN Class. The ships were originally named AARHUS and AALBORG, but later the same year (1939) the names were changed to NYMFEN and NAJADEN, under which names the ships were launched 1943. The unfinished hulls were laid up at Holmen in Copenhagen after August 29, 1943, and were not finished by the Germans. In October 1945 it was decided that the skips should carry the names HUITFELDT and WILLEMOES in stead.